Single ply roofing is any sheet of plastic-derived material that is used to cover and protect flat roofed and low-pitched buildings. In the last 30 years, single ply roofing has displaced older materials, such as tarpaper, as the go-to roofing material for commercial roofing contractors. This is due to the low-cost and high durability of properly installed commercial membrane roofing. PVC membrane roofs have been used for decades. They are time tested and still a popular roofing system. 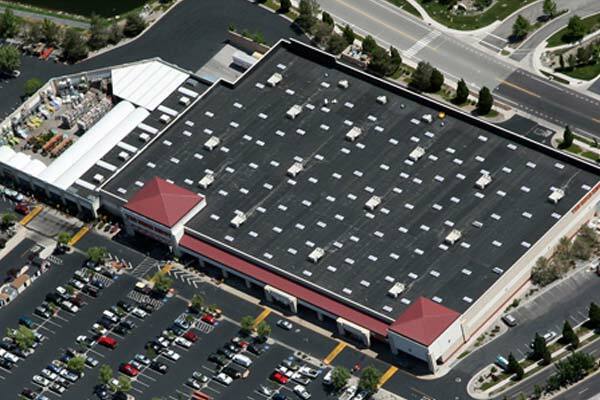 EPDM roofing has been the top choice for single ply roofing for some time, but TPO roofing, which is the newest, has been quickly gaining popularity. The Ballasted System – This system provides fast coverage at minimal cost. It utilizes large panels of rubber roofing membrane, up to 50 feet by 200 feet, loose laid on the insulation and then covered by approved ballast, such as river washed stone. The Mechanically Attached System - This system fastens the flat rubber roofing in place by first fixing mounting plates through the insulation to the roof deck, laying the membrane in place, and then attaching it to the underlying plates. The Fully Adhered System - This system can be used in roofs that have a little bit of slope to them. The mounting plates are used to anchor the roof insulation to the roof deck and then the single ply roofing is bonded directly to the insulation. Induction Welded Roof Installation – When mechanical attachment is possible, an induction welded roof system can decrease the amount of penetrating fasteners by up to 50%.